STATUS: UNKNOWN: The deeply mysterious Agent X has disappeared; his status is unknown at this time. A mysterious escapee of some kind of super-soldier experiment, the only thing more mysterious than his past is his real identity. Comparable to John Wrath in his capabilities, Agent X never served with Millennial Men concurrently with that old warhorse. He appeared seemingly at random when Hype, Gravitic, and War-Man suppressed a superpowered altercation at the MC Zoo arranged by Papa Zombie as a distraction, Agent X discovered and infiltrated Papa Zombie's operation, getting the inside scoop on what was going on. After helping to defeat the pack of zombie's left by Papa Zombie to guard his base of operations, he disappeared and has not been seen since. A super-skilled agent, a Scrapper/Infiltrator. Agent X was an amnesiac victim of a VIPER experimentation. 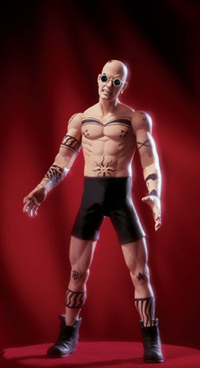 Genetically redesigned to be a perfect physical specimen, and trained to be the perfect spy, Agent X has a bizarre ability to alter his skin tone, hair, and facial features; he can change his appearance to look like an average male member of any type of humanity. He cant mimic individuals, but he can vary his appearance widely. Agent X's player moved to Minneapolis, where he can pursue a career of mocking people from St. Paul, despite the rest of the world's insistence that Minneapolis and St. Paul are just one big city and they should all just get over it already.